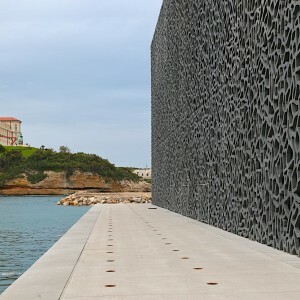 The new Museum of European and Mediterranean Civilisations in Marseille, the much anticipated MuCEM is now open to the public. The building was designed by Rudy Ricciotti, and will certainly become the city’s new cultural hub. The museum itself offers an anthropological perspective into such a wide subject matter, that its purpose has been questioned. The French magazine Le Nouvel Observateur asked whether it will just become another building where folkloric objects hang from the ceiling from a fishing wire. As a social space the museum has great potential, with a beautiful auditorium and a restaurant orchestrated by the the city’s star chef Gerald Passédat. It brings new life to the port area, shifting the pedestrian flow to the seafront. We were introduced to the interior, still far from finished two weeks ago, by project architect Tilman Reichert, and were particularly impressed by the fine concrete material, with a smooth and elegant dark grey surface. A very different form of concrete, from the way it was used in its raw form at l’Unité d’Habitation, another Marseille landmark. More on MuCEM in the Grand Tour summer issue out next week.